This narrative-driven audiobook will inspire listeners to see every circumstance as a chance to know God more deeply. What does it look like to know God's nearness when your world falls apart? What does it mean to receive new life when earthly life remains barren? Sara Hagerty explored these questions when life stopped working for her. She met God in a new way, first, when she was a young adult mired in spiritual busyness, and when she was a new bride with doubts about whether her marriage would survive. This discovery of God unfolded as she cradled her longing for babies who did not come. And years later as she kissed the faces of children on another continent who had lived for years without a mommy's touch. In the tradition of Ann Voskamp, Hagerty masterfully draws from the narrative of her life to show listeners a God who is present in every changing circumstance--and in every unchanging circumstance. 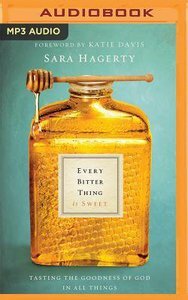 With exquisite storytelling and reflection, Every Bitter Thing is Sweet guides listeners to the place where God reveals himself anew as He shapes the bitterness of lost expectations into deep, new places of knowing Him. About "Every Bitter Thing is Sweet: Tasting the Goodness of God in All Things (Unabridged, Mp3)"